If you want to have a drink any time of the day anywhere and in any kind of weather, purchasing a tea infuser bottle is the best option. It is portable, light, and it can retain heat. You can take it to your place of work, or when you go for a walk, or camping, hiking, fishing, cycling – and so forth. You can use it to make hot drinks in cold weather and cool drinks in hot weather. You can use it to make tea, coffee, fruit-infused water, and so forth. You can also use it as a water bottle. Let me tell you about the best tea infuser bottles currently on the market. What’s a Tea Infuser Bottle? A tea infuser bottle is a device you use to steep or brew your loose, dried tea leaves. However, most tea infuser bottles have multiple uses. You will see that when you read the reviews. Not only can you use them to make tea, but you can also use them for coffee, and even to make fruit or veggie-infused water. And when you are not using it to make any of those things, you can use it like a regular water bottle. Tea infuser bottles are highly portable, and you can carry one with you to the office, on a camping trip, for a walk, and so forth. You can use it to make cold drinks (by adding ice cubes) during scorching weather or to make hot drinks in cold weather. You will note that most comprise a double layer of material (usually stainless steel, glass, or plastic). These two walls have a vacuum in the middle which insulates the inner wall, thus ensuring your drink maintains its temperature as long as possible. The first thing you notice about this infuser bottle is how pretty it is. It comes in an attractive tubular box around which you can tie a ribbon and send this infuser bottle as a gift to a friend. The bottle itself is made of smooth transparent glass and has two silver-gleaming lids on both ends. If you want to take a drink, hot or cold, along with you when you go for a drive, a walk, or when you are at your place of work, you should consider investing in this UEndure tea infuser bottle. The double-wall glass insulation ensures your tea remains warm for a longer period. And it’s not just ideal for hot drinks. You will find it just as useful in hot weather as in the cold. You can make a cold brew coffee or tea anytime you please: fill the infuser with coarsely ground coffee, then add water, and put the bottle in a refrigerator. It also agrees with all types of loose leaf tea. I don’t know about you, but I loathe lukewarm dinks with a passion. Give me a cold one any day – or a hot one that will nearly scald my tongue. That’s why I like this one. It has double wall insulation. Vibrant’s vacuum insulation technology consists of a vacuum cup that ensures air is sucked out in the space between the two walls, thus creating a vacuum. In a vacuum, there is no medium for movement of heat. For that reason, outside temperatures have a reduced effect on the inside. You don’t have to gulp down your drink in a hurry – it will retain its heat for a long period. On the same point, it’s worth mentioning the infuser bottle’s ability to keep your beverage at a consistent temperature, a quality you won’t find in cheaper, plastic bottles. And unlike some plastic bottles, there is no fear of chemicals leaching into your tea. The bottle is BPA-free. The infuser bottle is ideal for home, work, and even outdoor activities or travel. It will fit well in your cup holder. It is durable thanks to the stainless steel interior and exterior – so no fear of it falling and shattering like glass. And the premium matte grip finish makes it easy to hold, reducing chances of it slipping and falling from your fingers. What beverage do you enjoy: coffee? Tea? And would you like that fruit-infused? That’s what I like most about this Topoko infuser bottle. That it’s multifunctional. If you want to infuse veggies or fruit or loose leaf tea, this is the best infuser bottle for the job. These days most things we use cause harm to our bodies. You will, therefore, appreciate learning that this infuser bottle does not contain BPA. Bisphenol-A is an industrial chemical used in the manufacture of some plastics. BPA is especially risky for young children. Conscientious brands ensure that their products do not contain any chemicals which can cause harm to the customer. I must add that this Topoko infuser bottle is also lead-free. And if the weather gets too hot, you can make yourself a cold drink. The opening is big enough to put small ice cubes into it. And since it can also infuse fruits or veggies, you can make that a nutritious cold drink. At 13 ounces, the bottle is light, and you can take it with you when you go to work or when you go hiking or camping. Place it in your cup holder, bike rack, or backpack, and take off. Some water bottles make your water taste like plastic. Chemicals in the plastic leach into your water and you drink them unwittingly. Such chemicals may be harmful. One of the more common examples of such plastic chemicals is BPA. For that reason, it will please you that this infuser water bottle has FDA approval and is completely free of BPA. Not only will your water be safe to drink, but it will also be free of that plastic taste. Infuse your water with tea or fruit to give it a pleasant taste. The double walls accomplish two main things. One is protecting your hand from heat – since the inner layer contains the hot liquid, it’s perfectly safe to hold the outer one. And two is keeping your drink insulated from the external temperatures. And if you get bitten by the travel bug, or if you want to partake in some outdoor adventures, this is the water bottle you want with you. Unlike glass bottles, there is no risk of breakage when it falls. It is made with sturdy food grade plastic. Are you wondering what to give a loved one for their birthday, the holidays, or an anniversary? Here is the perfect gift. The infuser bottle comes with stunning packaging, beautifully wrapped, and you get a unique companion poem and a Rumi quote gift card. Whoever you gift it to will love it. The double walls of borosilicate glass will keep your drinks from turning lukewarm too rapidly. You can use it for a variety of purposes: loose leaf tea, organic coffee, fruit infusions, cocoa, and flavored water. And you can use it in a variety of environments as well: home, workplace, outdoors, and so forth. Since the bottle is slim and lightweight, it will be easy to carry wherever you go. Pure Zen is a brand devoted to the idea of according respect to one’s body and the environment. 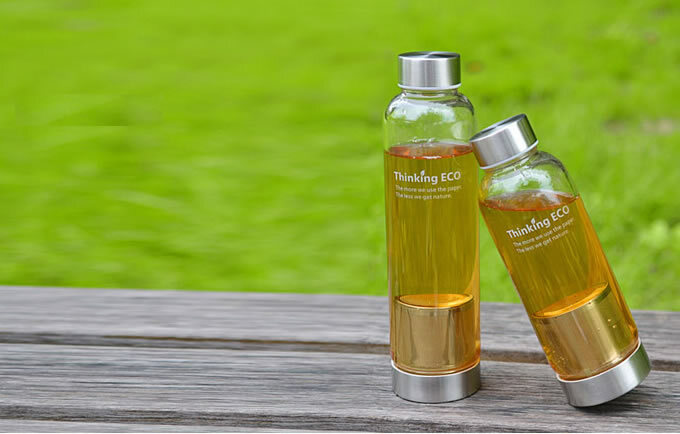 This 100% eco-friendly infuser bottle falls in line with this philosophy. It’s a pain when your bottle leaks or starts sweating .You unzip your bag to take out your bottle, only to find that your water is half full and your things have gotten damp. Fortunately, this infuser bottle is leak-proof. That’s one of the reasons why it’s ideal for a camping trip. At 400 ml, the capacity is not super large, but that also makes the bottle lightweight, so you can use it to make drinks while traveling. Here is a short list of some things you can make with this infuser bottle: green tea, white tea, black tea, matcha, herbs, and fruit infused water. Some people seem to enjoy cleaning. Sadly I am not one of them, and I know many people share my feelings. That’s why I like this infuser bottle. You can open it on both sides, and so the cleaning process is easier than it would be if the bottle had only one lid. It has two walls of borosilicate glass, one on the inside and one on the outside. The insulation prevents the external glass from getting hot, even when there is steaming water inside the infuser bottle – and so you won’t burn your fingers holding it. The second benefit of having a double layer of borosilicate glass is that your drink will retain its heat for longer. Thanks to the insulation layer, the heat won’t radiate into the air. There was a time you could trust in products, but sadly that day has come and gone. In our time, we must be vigilant. Even seemingly harmless things could be teeming with harmful substances. For instance, your bottle of water could contain BPA. But not this Cheven tea infuser bottle. It is a stunning specimen of smooth, rounded BPA- free borosilicate glass. BPA is a chemical used in making certain industrial plastics and is deemed harmful, especially to toddlers. This bottle is BPA-free, lead-free, and PVC-free. And it does not have any peculiar smell. The lids are made of food grade stainless steel. The glass is crystal grade. You can see right through it to watch as the tea infuses in the hot water. The glass is sturdy and resistant to both hot and cold weather. Also, it has high chemical stability. As I intimated earlier, it’s not difficult to make me feel content. All the product has to do is make the cleaning process less tiresome. Like most people, I favor efficiency. And on that count, this tea infuser bottle did not disappoint. The stainless steel lids are easy to clean. And the bottle allows air to flow in to enable natural drying after you have finished cleaning it. It also helps that you can disassemble it to give it a more thorough cleaning. With a variety of functions such as fruit water infuser, traditional tea tumbler, and coffee mug, it’s not a product you should pass up. It will fit in well with your schedule, whether at the office, in the car, cycling, at the gym, yoga, traveling, hiking, and so forth. A tea infuser bottle is ideal for all environments: home, workplace, indoors, outdoors, leisure, work, and so forth. It’s a versatile product even in its applications – not just tea, but also coffee, tea infused water, and others. Are you troubled that you can’t figure out what the best gift to purchase for your loved one is? Choose one of the seven tea infuser bottles I have reviewed. Your loved one will love it!